Ron Ben Israel Cakes specializes in the art and science on the baking process of none other than cakes. Ron says that each cake he makes with his team is a symbol of their performance. Full of exuberance and liveliness, Ron Ben Israel Cakes never looked so yummy throughout the years. Being also a dancer at heart, Ron choreographs his way through baking confectionery that has been a part of local patrons’ lives as the finest NYC wedding cakes. According to New York Times, he is the Manolo Blahnik of wedding cakes. Collections come according to life’s fantasies in innovative names of romance, bold statements, graphics and textures, lace and beading, for him, for her, for little ones, good times and the Bling! Ron Ben Israel Cakes are unique and bears a place for itself in the city. 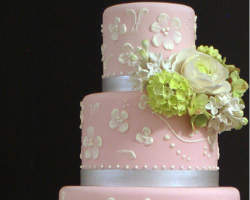 At Pink Cake Box, every need of the bride and groom is met when it comes to gaining the best NYC wedding cakes. The store serves and deliver at all points of the city. 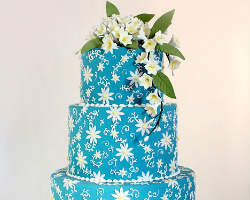 The couple can request for their cakes to be highly customized in adding personal details like sugary flowers, silvery ribbons and tasty colors that goes perfectly with the bride’s bouquet as well as her wedding dress. For more wedding reception ideas, check out the latest in their gallery a variety of wedding related cakes, cupcakes and cookie variations. See them in 10s or 100 forms by color, theme and type. Mark Randazzo features the simplest yet elegant touches in his wedding cakes, the store specialty. They bear rich epicurean flavors and chic cake patterns that were showcased in lots of lifestyles programs, like the Martha Stewart Weddings, as well as the magazines of Brides, New York Magazine, The Knot and Modern Bride. Tiffany & Co, The Frick Collection, and New York Fashion Week's annual Fashion's Night Out also took a try of his wonderful wonderful cakes. Mark Joseph Cakes remains smooth to taste, but still sweet and sugary. 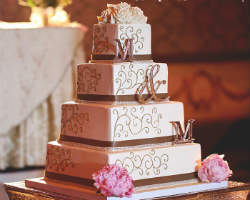 They make lasting impressions to wedding celebrations and custom cakes in NYC. Your wedding cakes can come as a cascade of garden flowers full of handmade sugar tulips, ranunculi, hydrangeas and peonies (all edible,) or a replica of Peter Rabbit for a themed kid’s party. Enjoy them in different ratios you want. Keep the little girl within you and make a cake full of surprises on your wedding day. Haute So Sweet takes pride in baking cakes that are a combination of elegance and chic couture, for milestones in eating and having the most delectable wedding cakes. Match it anyway you want for your party’s theme, tables, flowers, ribbons and decorations. Or add personal touches that reflects the real you, for couples a symbol of their “I Dos” on the special day of their lives. During summer choose to add light teal shades, but for spring by layering fresh flowers you will have a county inspired cake. Like a cascading garden for cake toppers. Palermo Bakery is a family owned business taking pride for its baking fame for over 25 years now. Joanne and Jerry sells retail/wholesale baked goods known for its vintage recipes and essential Italian touches in desserts ever since. 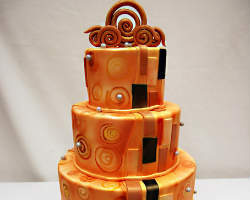 Today, Palermo Bakery cooks the best custom cake designs among cake bakeries in town. Where, customer satisfaction is protected in full maximal goals of undying pleasure for eating mouth-watering bites of Palermo Bakery goodies. In a motto, “if you can think it, we can bake it,” the customers take part in revealing their own terms of creativity and new fangled ideas just for their cakes. A White Cake hosts baked goods which are deliciously elegant custom cakes created by Lauren Bohl White, who has a keen passion in baking cakes. She makes it in colorful sweet streamlines, well-dressed flowers, elaborated ornaments and whimsical fantastic touches. Lauren also owns A Simple Cake, a hip online cake business, which was opened to public last 2009. 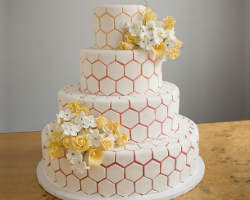 Try the Honeycomb design for your wedding cakes or Susan Spungen for a fruity treat on your wedding day. Flavors and fillings can be sweet or spicy as the married couple-to-be, meanwhile, the store will create your flavor combination of buttercream or fondant as final touches. 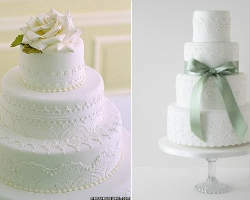 For something amazing, indulging and romantic NYC wedding cakes, A White Cake knows its craftsmanship best.